The famed logo for Japanese baseball! In November, I wrote about friend and collector Kohei Nirengi, collecting TTM autographs of past major leaguers while living in Japan. Q: Some American MLB teams are encouraging all players not to sign fan mail. In some cases, like the RedSox, a form letter and pre-printed “autographed” photo will be all you get. For teams like the Pirates or Tigers, much of the roster will supply a price list. Send your item and a donation to the community charity. You had mentioned that you received Bobby Scales by mail in care of his team in Japan (Ham Fighters?). Whether it is Americans playing in Japan, or current Japanese players, how well do most respond to fan mail? 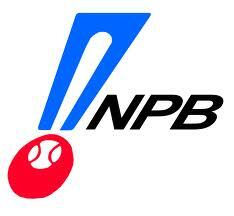 Or, in what ways might it be easier for a fan in Japan to collect current NPB players by mail? A: Yeah, you’re right, I sent my request to Bobby Scales by mail in care of his 2011 team here in Japan ( the Hokkaido Nippon-Ham Fighters ), then I got his signature. I’ve never recorded any dates of my requests via TTM, so, excuse me, I don’t know a successful percentage correctly, my guessing would be 70% or so. TTM is getting popular in Japan year by year, but our interest in it began in this 21st century, I thought, so that here are still fewer fans collect autographs by mail than Americans do there, like you guessed. Q: There will be more star Japanese players coming to America in coming seasons. From other collectors or your own experiences, had such stars as Ichiro, “Dice K” or Hideki Matsui signed by mail in Japan? A: Yes, all my requests to the active Japanese ballplayers were sent in care of their each team. I’ve never seen anyone succeeded in getting neither Ichiro’s autograph nor Matusi’s as both were in NPB. However I’ve seen few collecters, who have their own websites or blogs about TTM, could get Matsui’s autographed “baseball” by mail as he played for the Oakland A’s in 2011 season. I have never tried to get anyone’s signature on a baseball, though. As to Dice-K, I knew that Matsuzaka had responded his requests from the fans when he pitched for the Saitama Seibu Lions. If you try to send the Japanese ballplayers, your handwritten letter is much better than typed one because of our Japan’s traditional custom. Q: Lastly, what’s been examples of some of your fastest responses from America? A: Took just 10 days, I remember my fastest response from your good old U.S. FYI, December is not good for TTM because it’s the busiest time of year for our post offices as well as the USPS from Thanksgiving to Christmas, my American friend taught me that. Thank you, Kohei. I hope your mailbox bulges with responses from both leagues in 2012. Coming Wednesday: An insight about typed letters, from Mr. Tiger — Bobby Hoeft! Another vote for hand-written letters? Some teams tell there players not to sign for fans through the mail? I never heard that before. Is that true? We are fans and paying customers. How could a team tell there players to do that? That is ridiculous. It takes a few seconds for a player to sign a baseball card.